Counting to 30, fill in the missing even numbers. Have kids say all the numbers, then just the even numbers, out loud while tracking with their fingers. 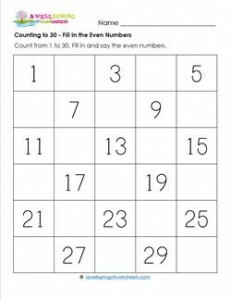 Please go to this page to see all the counting to 30 worksheets in this set.